Escher’s Knot’s five-track debut EP, Tessellations, flaunted intricate and complex song structuring with its riffs and progressions. Listening to the EP, one realizes how unpredictable the general configuration of the band’s music is; the breakdowns seem like they were breakdowns for another riff altogether, but still fit in perfectly, each rise in the song coupled with excellent instrument work by each one of the members gives the band’s music an intellectually inclined attitude. Abijith says, “It has been a really good process of evolution with regards to sound and the style of the music, and what we’ve played since Tessellations up ’til now.” But, the band’s music is still misjudged, “We do have a lot of progressive elements,” Abijith says, referring to most people’s definition of their music, “and a little bit of death and thrash involved. But, I would just like to call it heavy metal.” The debut EP was quick to make its appearance, being released within just a year of the band having been formed, in 2011. Tessellations was recorded at the Clementine Studios in Chennai where vocalist Abijith used to work at the time. “We were really particular about recording live drums,” Abijith says, “It was an international recording studio as in it was into world music and stuff. But we managed to get the contact and all and we recorded live drums at Clementine, and the guitars and vocals as well.” The EP was sent in to Germany for production, mixing, and mastering with Necrophagist bassist, Stephan Fimmers. Although the EP was a quick addition to the band’s discography, their untitled debut full length album hopes to make an appearance this year – after a nearly three year long gap. 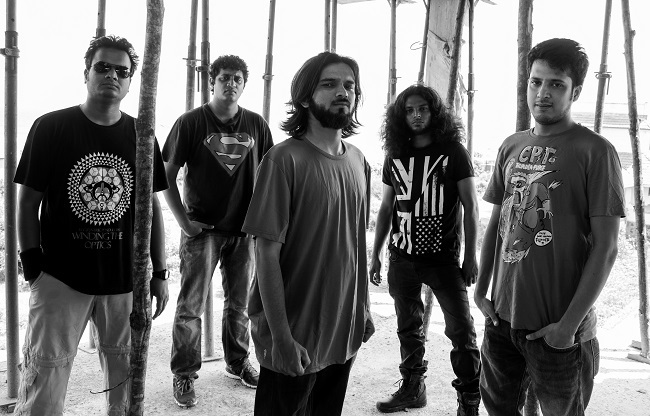 With the emigration of members, guitarist Anshuman Mishra and bassist Madhav Ayachit to Bangalore, the band faced a few hiccups – stern as they are to retain the original members of the band regardless of distance. “We were still writing music,” Abijith says “because either we would meet and jam in Chennai or in Bangalore. Then later, Anshuman got a job in Delhi, so he moved to Delhi and three of us headed down South.” At this point, sometime in October 2012, guitarist Siddhartha Ramanathan joined the ranks of Escher’s Knot, more as an addition than a replacement. “The idea was that no matter how far a member was, we’ll still stick together and somewhere down the line it will all come into place,” Abijith tells us.